The Mysterious Accident | Cricket Crazy!!! It was 10 in the morning when Sherlock Holmes with Dr.Watson was walking on the footpath when he saw a an accident on the road. Sherlock Holmes found something odd about it. Then he found out that the car had crashed on a tree. The car was majorly damaged on the right side but the person on the left side had died while the person on the right side had minor wounds. That night Sherlock Holmes with Dr.Watson went to the accident scene. He investigated for a while when he found out the speedometer blocked 20 kmph ! How can a person die at 20 kmph ? Then he found out a burner inside the seat. He went home with the speedometer and the burner. The next day he found the fingerprints of a well-known criminal, Baron Gruner. He visited the hospital where the person had been declared dead. The doctor said he had some major burns on his body. The case was clear now ! Sherlock Holmes rushed into Baron Gruner’s house with some policemen armed with 2 pistols each. Baron Gruner was scared and tried to rush out of his house but was in vain. 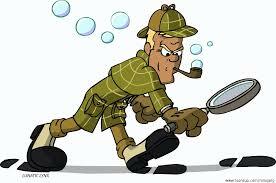 So, as usual Sherlock Holmes had solved another criminal case !